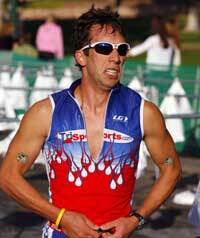 My first season as a “sponsored” triathlete was 2006. I found out early in the year that TriSports.com had accepted me onto the TriSports.com triathlon team. Unfortunately my 2006 season didn’t quite workout like I had planned. So it is deserving of major kudos to TriSports.com that despite my lack of results in 2006, they have once again extended me a sponsorship offer which I am happily accepting! Please support TriSports.com and tell them I sent you! About the picture, my teeth are clenched because I had just gotten my jaws unwired after 6 weeks! I followed this up with a list of 23 events that I was planning on doing in 2002. I think I actually ended up doing about 18 of the actual events I listed. I didn’t end up doing the Ultramax Iron distance race which is a good thing, I probably would have quit that year if I had! It’s fun to find these kinds of things and look back at them, see where you were and where you’ve come since then. That’s why I recommend keeping a workout log and always writing a complete race report following all races. It started out as a mild winter, but unfortunately it didn’t stay that way. Today was a nice break, it got up to a toasty 43 degrees! So I headed out to Rockbridge State Park for some trail running. We’ve had several inches of ice on all the local trails for well over a month, one would think that by now they would be clear, but that was not the case. Fortunately I had my cross country spikes with me, I would never have attempted some of the trails I ran on without them. Definitely a unique and a beautiful run. 8 hard miles, up and down steep hills, along icy ridges overlooking frozen creeks hundreds of feet below. In a few weeks hopefully the ice will melt, until then the spikes will be getting some use! 8 degrees with a wind chill reading of -5, to me that sounded like a good reason to stay in bed. Instead I talked myself into heading to the “Nut Race” and was one of 30 other nuts crazy enough to run a 5k race in the bitter cold. The course is a one mile loop which is run 3 times and includes a long gradual uphill on each loop. Matt Drier and Marc Keys were both there and I knew I wasn’t in any condition to challenge them quite yet. I actually figured I would just run and try to survive the cold, but as soon as the race started my competitive juices kicked in. Right off the bat some kid in a college track and field jacket went to the front followed closely by Matt and Marc. I tucked in behind them for the first half mile until we got to the hill. Then Matt and Marc passed the college kid and all three of them began to pull away from me. Apparently the college kid had gone out to fast as I caught back up to him and after using him for a wind shield for a minute or two, I realized I could run faster on my own so I moved on. By this time Marc and Matt were pretty far ahead and wouldn’t be coming back. My third place position wasn’t locked up as I knew there were a couple of fast guys behind me still. After running up the long gradual hill a third and final time, I was still in third and we were down to the last half mile or so. At this point I heard footsteps coming up behind me. I figured it was the college kid as I had never gotten too far ahead of him, only 5 to 10 seconds. Rather than trying to pick up my pace, I continued on at the same pace conserving my energy for a kick. If they were running faster than me I could only hope they were wearing down quicker and I also figured I could use whoever it was as a wind block when we rounded the final corner. The finish was a 200 yard stretch into the wind. As we rounded the corner I was passed but I tacked right onto his shoulder using it as a wind block. It wasn’t the college kid, it was someone else I didn’t know. I stayed on his shoulder for about 10 or 15 seconds and then started my kick with about 50 yards to go. He didn’t go with me and I finished 2 seconds up on him in third place overall with a time of 19:24, 6:14 per mile. Not as fast as I hope to be running soon, but for 8 degrees with 15mph winds, I’ll take it!